Today, I was in no particular rush, but I still woke up with the sun. I can't help myself. When the sun is up, and I'm outdoors, I'm up too. Kara and Erica warned me that they intended to sleep in until at least 10:00--pretty late by most thru-hiker standards. 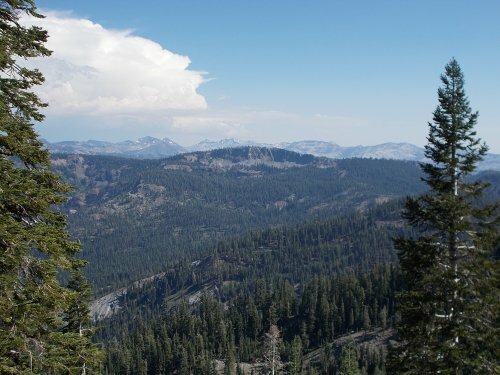 But they also explained that they were trying to do the section between Echo Lake and Donner Pass in 5 days to meet some friends and family. Off the top of my head, I figured that meant they had to average about 10 miles per day--which is nothing for a thru-hiker. Yeah, they could sleep in until noon and still have plenty of time to get their miles for the day in! So before I left, I wandered over to their camp and whispered lightly asking if they were awake. They were, so I told them goodbye and wished them luck on the rest of their journey, then I slunk out of camp and hit the trail. Then Coyote said she had a question for me. That they'd been feeling blah about their hike. It wasn't as exciting or engaging as it used to be, and what could they do to get that feeling back. Knowing that I had completed a PCT thru-hike, she figured I'd have all the answers, but I didn't. That was one question I just didn't know the answer for. I suffered that same feeling at times, and I never did find a satisfactory solution to it, and I told them that. The first half the trail, I told them, was mostly a physical challenge. 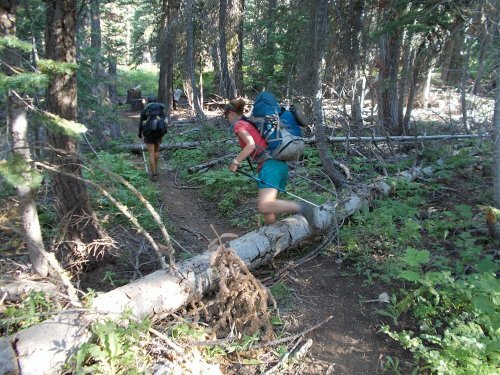 Getting your body into shape for 20+ miles of hiking every day. The second half the trail is more psychological in nature--keeping yourself motivated to keep going day after day. Physically, they've already mastered the trail. They aren't going to learn anymore skills or challenge their abilities. The trail isn't an exciting adventure anymore--it's work. "Yes!" they exclaimed. "That's exactly how we feel!" "Yeah, well, I don't really have a good answer for you. Sorry." They seemed really disappointed about that. "Well, I suppose you could try drugs. That might help!" Roadkill climbs over a fallen tree blocking the trail. They laughed at that idea, as I intended it. Roadkill kept running with it, though. "Yeah, and we'll have to start taking harder and harder drugs the further we get. By the end of the trail, we'll be addicted to heroin and saying, 'I looooovvveee the PCT!' Man... this trail is awesome!" But then we got serious again. "Keep in mind," I told them, "you two aren't the only people feeling this way. It's normal for most people. You aren't alone!" It's not much consolation, and I knew that, but it was all the advice I had to offer. "What about a zero day?" they asked. "Taking a day off to do something else and recharge their batteries." Maybe for some people, that idea worked, but it really never did anything for me. Oh, I certainly enjoyed the day off--but as soon as I was back on the trail, I'd fall into that same funk within five minutes of getting back on. Taking a zero day didn't really help me enjoy the trail anymore than I would have if I skipped the zero day. Coyote said she was really disappointed to hear that. Yeah, I can imagine. 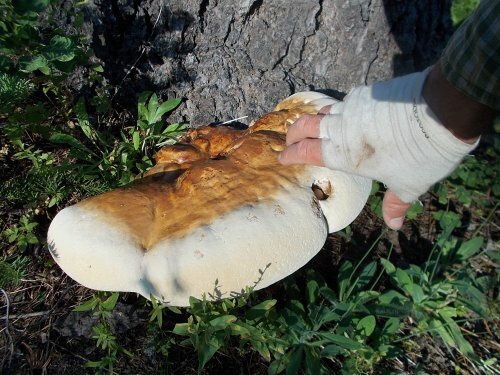 I know not everyone gets these funks. Some people just can't seem to get enough of thru-hiking. I told them about The Graduate--when he reached the end of the PCT, he went back and hiked the Wonderland Trail. Then went down to Florida and hiked the Florida Trail. 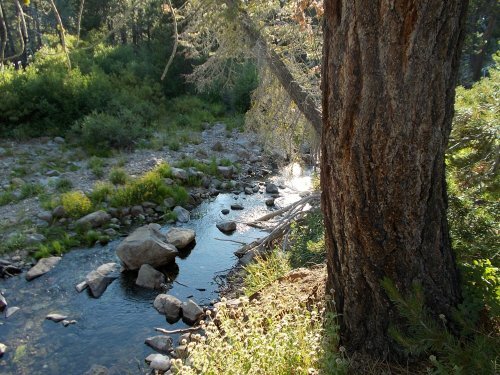 Then out to Arizona and did the Arizona Trail, which connected to the Hayduke Trail, which connected to the Continental Divide Trail, which connected to the Great Divide Trail. After probably close to 10,000 miles of near continuous backpacking did he finally call it quits! "But he's freaking crazy," I told them. "Most people aren't like that. When I reached the Canadian border, I was good and ready to get off, and told myself that I would NOT be thru-hiking the next year." The two finished packing up camp and started walking, so I joined with them for a bit. Eventually they stopped to pee and I contiued on without them finally taking a break at Barker Pass--another major trailhead for the TRT. Barker Pass had an outhouse, which I made use of, and picnic tables of which I immediately claimed one. Coyote and Roadkill caught up shortly thereafter and we all took a good, long lunch break here. Or a snack break. I don't really eat "lunch" per se--I just snack throughout the day, but I did a lot of snacking here. This trailhead was packed with people. Being a weekend probably contributed with all of the dayhikers there, but Coyote and Roadkill were positive celebrities for being PCT hikers and having hiked there all the way from Mexico. I had to smile whenever a new person asked them how far they had come from, when they started, and the usual assortment of thru-hiker questions I'd heard so many times before. "Don't look at me," I would say. 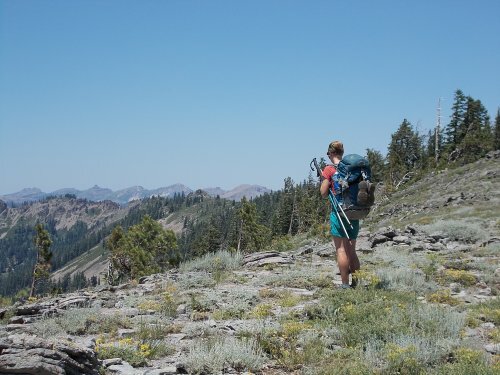 "I'm just thru-hiking the Tahoe Rim Trail this year--although I did do the PCT a few years ago." For me, I was more than willing to tell everyone that I was working on http://www.Walking4Fun.com -- taking at least one photo for every mile of the Tahoe Rim Trail that I would upload to the site when I finished my hike. 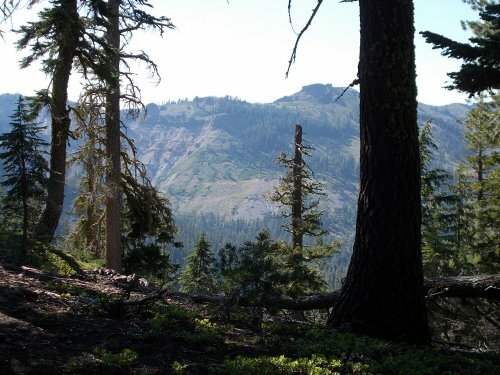 "You might not have the time or inclination to physically hike the entire trail yourself," I would tell them, "but you can still do it virtually! I even have support for the PCT all the way from Mexico to Canada!" 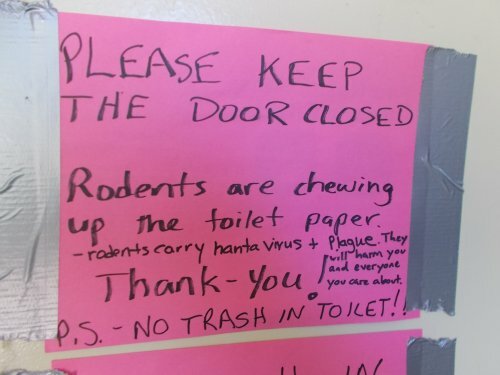 "rodents carry hanta virus + plague. They will harm you and everyone you care about"
Another person asked what they were craving to eat, and Coyote gave some sort of answer--I don't even remember what now--about some sort of food or drink, but it was something that nobody could possibly have in their car. Like ice cream or something. Don't these two know how to yogi?! Suggest something that these people might actually have to offer! So I said, "But if you have an ice chest with cold sodas, I'm sure they wouldn't complain!" Everyone laughed at that, but I guess they didn't have an ice chest with cold drinks because none was ever offered. I tried, though. Work the crowd! =) But my efforts were in vain--we got no additional trail magic beyond the apple and pumpkin seeds. 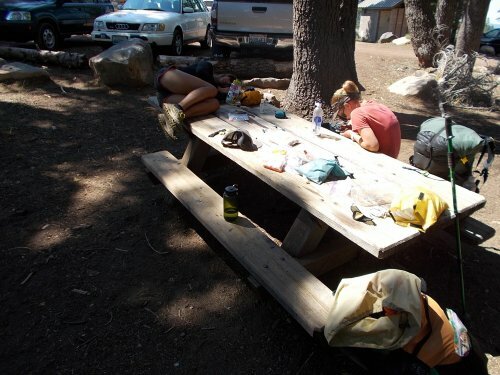 Coyote takes a nap on the picnic table at Barker Pass. Coyote and Roadkill took off shortly before me, and I eventually caught up with them a few miles further down the trail. 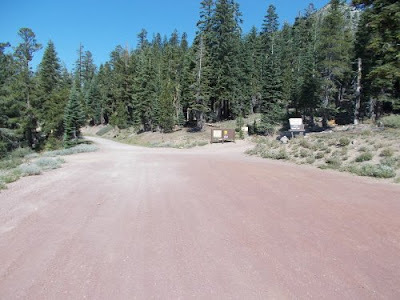 It was a short-lived reunion, however, since we finally reached the junction where the PCT splits off from the Tahoe Rim Trail. They'd continue going north. 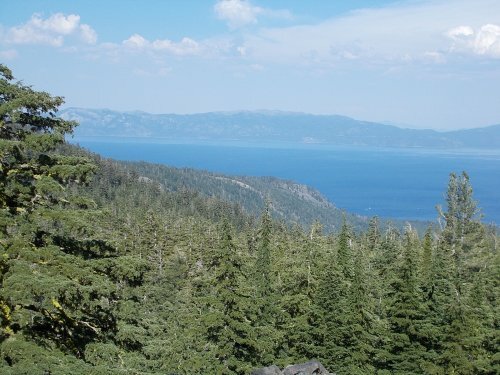 I'd start heading eastward to Tahoe City. I was a little sad to split off from the PCT. 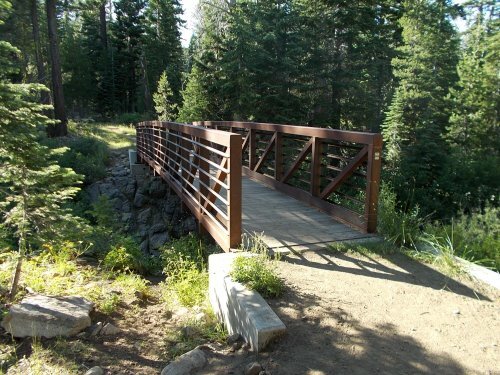 I enjoyed chatting with other thru-hikers, and I had yet to meet a single other person actually thru-hiking the Tahoe Rim Trail. 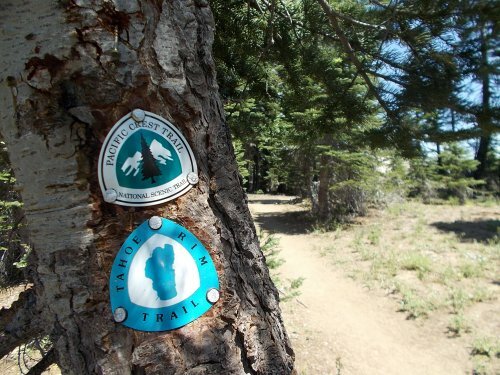 It's possible that some of the people I passed walking the other direction on the Tahoe Rim Trail were thru-hiking it, but none of them looked like thru-hikers so I couldn't identify them on sight like I could with the PCT hikers. They weren't grubby enough, skinny enough, or strong enough to separate themselves from all the weekend backpackers. 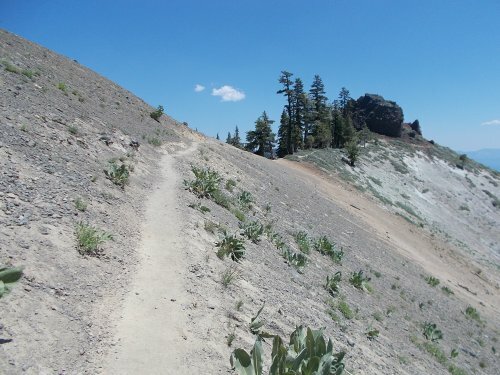 Once I left the PCT, the number of people on the trail fell dramatically--I could count with two fingers the number of people I saw on the trail after I split off from the PCT. Late in the day, I filled up with water at Ward Creek--the only water source between me and Tahoe City which I intended to go into the next day. I considered camping there, except it was surprisingly close to a roads that I didn't want to camp near. 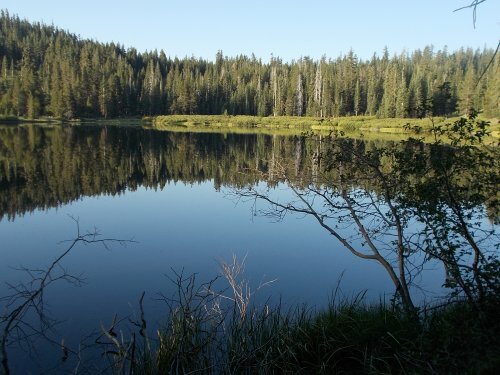 I filled up all of my water containers and pushed onward to Page Meadow where I eventually set up camp. 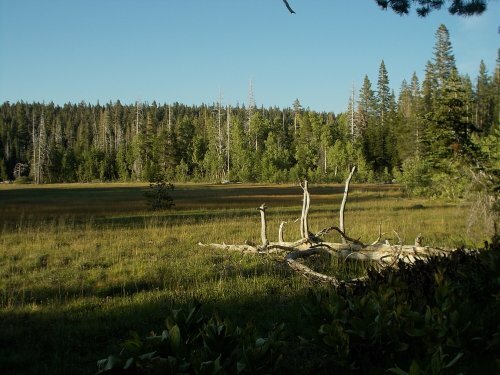 Page Meadow was beautiful. The wildflowers were perhaps a bit past their prime, but it was still a stunning place to set up camp, and that's exactly what I proceeded to do by the edge of the meadow. 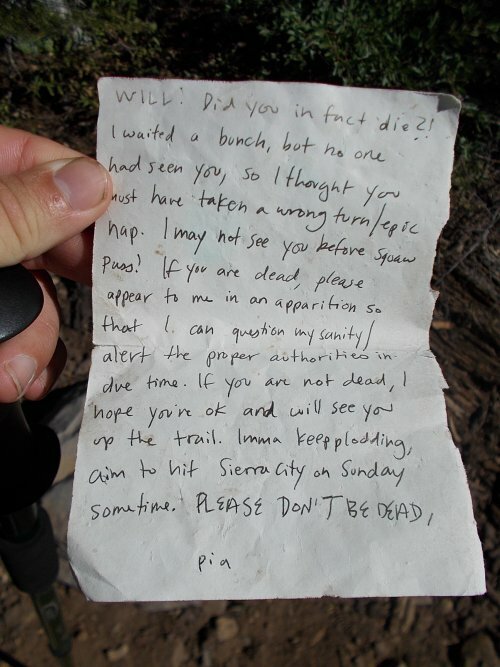 I found this trail note, left for Will from Pia. PCT mail! I was rather amused by it, though. An "epic nap" sounds like a great idea! 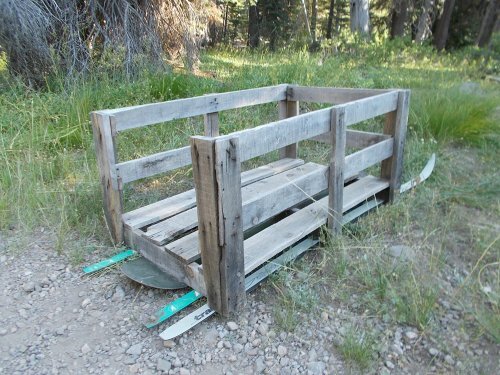 the PCT in an attempt to keep away from the horrible plague of mosquitoes. Roadkill admires the view in the Granite Chief Wilderness. and down the ridge to the left (which can't be seen in this photo). 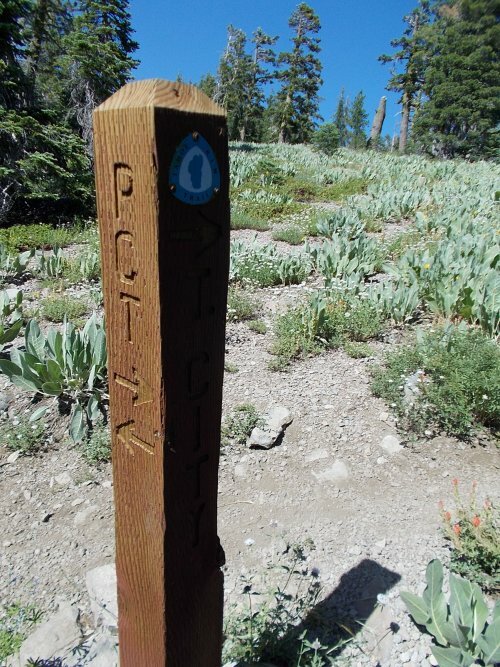 This post marks the junction between the PCT (left) and the TRT (right). It was time to leave the PCT behind. the TRT veered away from the PCT. Strange thing found on the trail #132. Hey, that's for me another portion of very educative information about thru-hiking! And a good reminder to keep my dream of hiking the PCT some time alive! Thanks =).